Food for Fines returns to Princeton Public Library this year to area libraries, forgiving fines while benefiting local food pantries. Eight area libraries are sponsoring this annual “Food for Fines” amnesty program benefiting area food pantries. From November 5 through 17, these libraries will accept canned or boxed non-perishable food donations as payment of overdue fines. As in past years, the collected donations go to area food pantries, helping restock shelves. 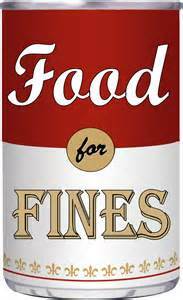 Each donated food item pays a $1.00 in library overdue fines up to a maximum of 25 items to pay $25.00 per overdue library account. Donated food is not accepted for lost or damaged books, replacement of cards, or interlibrary loan fees. Because of food safety concerns, the pantries request items be in their original packaging; damaged packages, outdated food or glass containers are not acceptable. Suggested food items include canned fruits and vegetables, soups, cereals, pasta mixes , and canned meats. For more information, please call a sponsoring library.